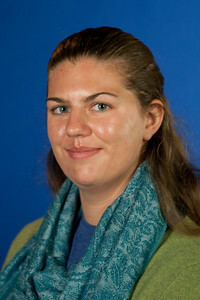 Katelynn Taylor, a junior at Indiana State University, is one of 181 student leaders nationwide selected by Campus Compact as 2013 Newman Civic Fellow. Named in honor of Frank Newman, a founder of Campus Compact, the Newman Civic Fellows represent the next generation of public problem solvers and civic leaders. They serve as national examples of the role that higher education can-and does-play in building a better world. Taylor, an English major, has worked to help improve the health status of underserved and uninsured residents through her capacity building activities at St. Ann Clinic. Her involvement at the clinic has included serving as an AmeriCorps member through Sycamore Service Corps and a service-learning student participating in the first cohort of the university's Service-Learning Scholars program. She observed through her interactions with the director that administrators were dedicating an extraordinary amount of time to training and re-training short-term volunteers. Taylor helped solve this problem by developing the first training manual for volunteers. "Rather than making the manual one large booklet, I wrote a section for each part of the clinic where a volunteer might serve, "Taylor said. "Starting with the pharmacy, I wrote a description and instructions for each volunteer position, and provided electronic copies to each relevant area of the clinic." This project has made effective use of her combined English and Pre-Med academic skill set. "It gave me the chance to exercise clarity in written communication, but also familiarized me with the clinic's varied volunteer opportunities," Taylor said. "I have already seen the manual help speed up training for new volunteers, and have also observed the addition of several early edits compensating for changes in procedure." The manual has helped save the administrative staff a great amount of time that they can now dedicate to fundraising and program development. Taylor, who moved to Terre Haute from Portland, Ore. in 2010, also has helped organize the pharmacy at the center. St. Ann Clinic receives donations of pharmaceuticals from many sources. She draws upon her science background as a participant of Indiana State's pre-med program by cataloguing donated pharmaceuticals and assisting in their disbursement. Through service, research, and advocacy, Newman Civic Fellows are making the most of their college experiences to better understand themselves, the root causes of social issues, and effective mechanisms for creating lasting change. The Newman Civic Fellows Awards are made possible through the generous support of the KPMG Foundation.